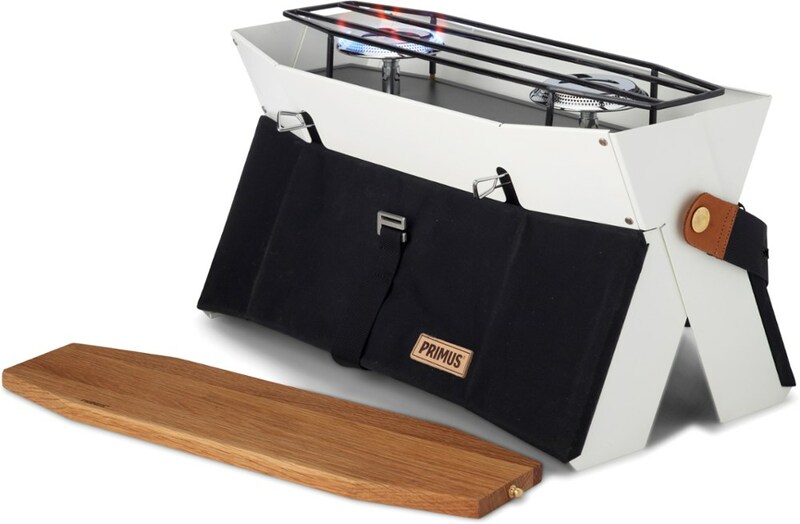 Great stove for car camping with an innovative design that helps to get the cooking surface elevated off the ground. Powerful burners that can be controlled to get a simmer if necessary. Would definitely recommend for small group car camping and picnics where portability is necessary. The setup for the stove is pretty easy since you just turn it over and attach the fuel canisters to the bottom. The advantage this provides is that you don't need to carry the fuel separately and it is already attached when you are ready to go. 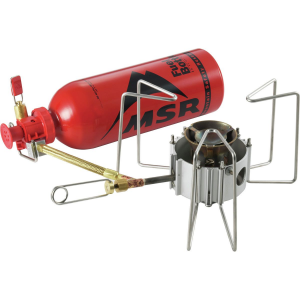 There is no ignition system built in and this provided a little challenge but since most people already travel with a lighter when they car camp I wouldn't be concerned about not being able to light the stove. Just set the gas level to low before you light. The flame is adjustable and very sensitive so you have to play around with the control to get the temperature you want. It takes a little getting used to, but in the end I was able to get a nice range of flame levels. The stove cooked wonderfully and we were able to use it for several purposes including simmering couscous, frying vegetarian sausages and mushrooms, and boiling water in a coffee pot. The stove top is large enough to accommodate most camping cookware. 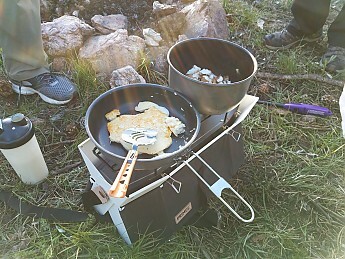 When the stove opens up the frame provides both an elevated cooking surface and acts as a windscreen. 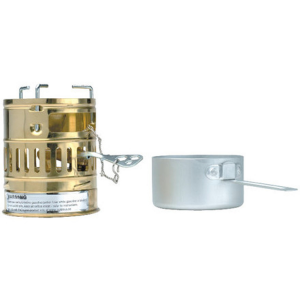 I used the stove in a mostly windless situation and could imagine a large amount of wind would cause some issues with cooking but it wasn't a problem for me. The design of the stove is nice since it makes it where you can cook sitting on the ground and still have a cooking surface elevated. Additionally, the stove itself is very stable though the slick cooking grates made it seem like a lighter pan might slide off if not level. 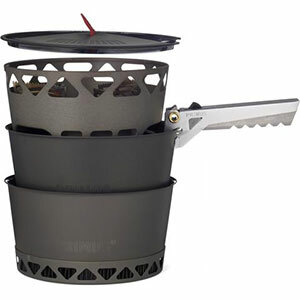 The biggest advantage to this stove is its easy packability and shoulder strap that makes it unique from most stoves like it. It was one of the coolest looking stoves I have seen on the market and its design did not hinder its function. 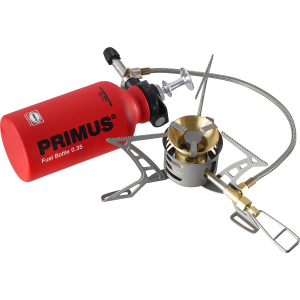 Overall it was very easy to use and I loved the innovative design Primus used in rethinking the car camping stove. Welcome to Trailspace, Asher! Do you have any pictures of the Onja in use you could add to your review. it's a pretty unique design and it would be helpful for others to see. Overall, solid piece of gear. 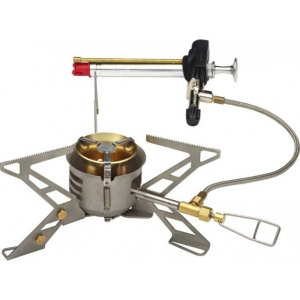 Great solution for those looking for home stove top-quality stoves to take outdoors without the price tag, weight, or footprint issues of conventional camping stoves. As a member of another website, I get products from time to time in exchange for a review. A versatile, well made and compact designed product that has allowed me to expand my cooking options on so many activities. 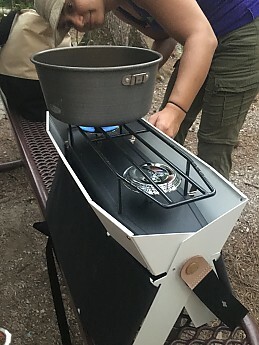 Before I was limited to carrying the backpacker, single-serving, water-boiling stoves for day hikes and road trips to keep my stove from becoming a huge space waster in the car. That meant freeze dried, basic meals. Now I have an actual stove that is relatively lightweight and very portable. The burners themselves are very easy to control with the adjustment knobs, and the temperatures are easy to control. 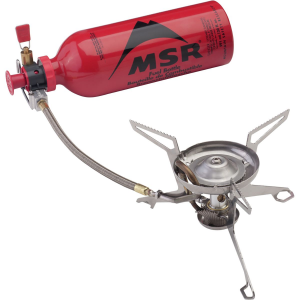 The gas canister connections to the burners are well threaded to securely handle your gas bottle—something pretty important if you're putting this over your shoulder as you walk. 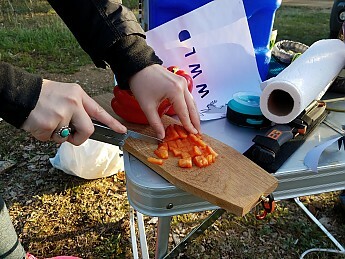 You usually need a cutting board when camping anyway, so to have this included and not add to my footprint of supplies was convenient. It also protects the burners and port supporter when not in use, which I thought was pretty clever. I would have liked to have seen a self-ignition or Piezo ignitor-type offering with this product. Having to carry a BBQ lighter just to light the thing isn't inconvenient for car camping, but it's a nuisance for a day hike when you're trying to carry as little as possible to save weight. I also wish the cutting board was a better piece of wood. I've used the stove on three tips and I've had to oil the board twice. Not a huge time or expense, just something to remember to do to extend the life of the board. Wish I didn't have to do it as often though. Welcome to Trailspace, Daniel! 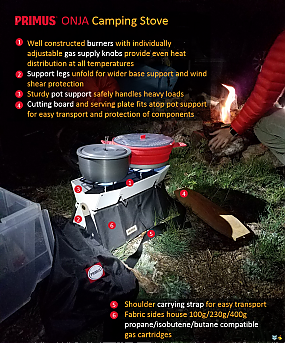 The Onja is an interesting stove option. Do you have pictures of it in use you could share in your review to show others? Also, did you buy yours or were you given one to keep for review purposes? Hi Alicia. I have updated the review to include pics. I didn't see the option the first time around, thanks for the suggestion, I will make sure to look out for this in the future. As far as purchasing, I was given one to keep for review purposes. I did my best to select these options and use disclaimers in my review to make that point. Let me know if I can do something additional. Thanks. Thanks for adding those helpful pictures, Daniel, and for the clear disclosure. We really appreciate it! I'll look forward to reading some of your future reviews.